A very pretty decorative evergreen tree which grows in a column like structure. 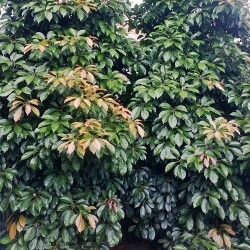 It has broad dark green glossy leaves which flushes bronze and maroon during new growth. Climate: Warm to tropical climates. Growth size: 8- 10m h x 4-6m w.
Perfect for: Feature tree, hedging, screening.